You may already have heard of vegan Mark Boyle, the former businessman who vowed publicly to live totally without money for an entire year. With my interests, this was a book I had to grab from the Librarian Recommended shelf. You can read about his experience in many online interviews, but the book really gets into the details. Why? Mark had become disillusioned with our money system. The first simple role of money is as tokens in a bartering system. But we've left that far behind, and money games now include international currency trading, derivatives, stockholder profits, and more. The more complicated it gets, the fewer people can possibly understand the game and get a living share. Mark cites the impact of money on community, security, competion/cooperation and the climate as vital motivations for his drastic change. Mark first discovered the vast difference between living frugally and living moneyless. He had to scrutinise every item he might consume, and he gave himself a small budget to set up his moneyless year. On the night before his challenge would start, he got a puncture in his bicycle tyre, stranding him far from home and help - I was quite impressed that he solved this in the same DIY way he'd committed to begin the following day. 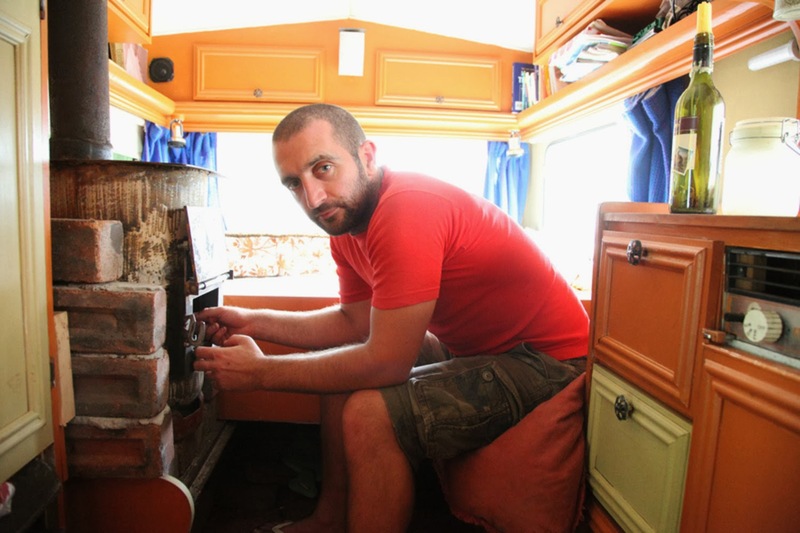 Shelter - On Freecycle, Mark was given a decent caravan that was a burden to its owner. In our world of overconsumption, there is an oversupply of still-useful products that are not in use. Networks like Freecycle help solve this problem. And he bartered his labour to a farm to get a space to park the caravan. Sanitation - DIY Composting toilet, solar shower. Drinking water from the farm. On top of all of that, Mark successfully organised a free, moneyless feast for about 150 people for his first challenge day, Buy Nothing Day, 2008. (Remember, when things went wrong, he could not just spend his way out of the problem.) The success of the publicity overall meant that Mark spent a lot of his time early that year giving interviews! 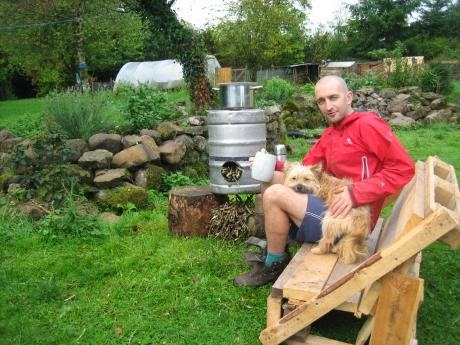 Mark's typical moneyless day has exercise, wild foraging, personal grooming (with no purchased products), meal preparation, and online and farm work. After the day's work and dinner, he might cycle to a meeting and back (36 miles). The book explains how he handled problems like the oncoming winter, keeping his bike in action, keeping in touch with friends, Christmas, international travel and doing everything the slow way. It also reveals a few facts worth knowing about the wastefulness of the "regular" way of doing things (eg: water usage from a plumbed vs composting toilet). Like any alternative lifestyle, one of the biggest barriers is interacting with the rest of the world. The media interest was fading, and he did his best to keep up with friends, but Mark's romantic relationship did not surive the strain of his challenge. While Mark's general health was even better than anyone expected, he did have to find a natural remedy for his hay fever. He also had a tiny mouse visitor who became a big problem. Mark learned about other people around the world who also lived with little or no money, including Daniel Suelo and Heidemarie Schwermer. Heidemarie started an exchange group (Tauschring) to help people live without money, and Mark started the Freeconomy site. Summer brought more ease to the moneyless life, and Mark describes how much food and fun there is available for free. Developing communities like Freecycle, Couchsurfing, etc, make it all even easier. Mark found that the closer he got to the year's end, the less he was worried about ending it. He and some friends had a great wild-food foraging adventure, and Mark himself chose to spend a week in silence - probably a good preparation for the finish line and the renewed media attention. He celebrated with an even bigger free "feastival" for hundreds of people, and handled media that brought a range of applause, curiosity, and criticism. And he made his decision that he was not going "back" to his regular life. The book finishes with the lessons Mark wants to pass on from his moneyless year. Even if you have no urge to live moneyless, this book will open your eyes to the casual overconsumption our society is based upon, alternative choices you could use, and the people and organisations who seek a better way. Mark's experience would have been quite different without the overabundance of products going to waste each day. However, without all that waste, everyone's lives could be richer.